PLEASE DO NOT TAKE THIS FOLDER HOME WITH YOU! It says on the front of this folder beside my computer. Oops! Oh well, it’s useful for checking up on some facts. I went on a three-day French House Party ‘Cuisine in Brief’ cookery course in the Carcassonne. The house, Domaine St Raymond, is owned and run by Moira Martingale. Moira’s the author of two internationally-published books. She’s a journalist, feature-writer, and a former columnist for several national and regional newspapers in the UK. She has a novel nearing completion, a PHD in Gothic Literature, and a teaching qualification. After staying in her house, I think she should add Interior Designer to her list of qualifications. It’s really tasteful, blending together perfectly, and she’s thought of absolutely everything that her guests need. The house is over 300 years old. It’s probably a converted barn, judging by the arched windows. There are eight bedrooms, all completely different, named after fruit and plants, eg Olive, Abricot, Aubergine, Chocolat, Framboise, Lavender, Pomegranate.and decorated to match their names. They all have en-suite bathrooms. Downstairs there’s a games room, with a jukebox and a pool table, and outside there is a huge swimming-pool, a table-tennis table, tennis court, boules pitch, and bicycles in the garage. I was offered more food than I could manage to eat, you can help yourself to hot or cold drinks any time of the day and night, and the locally-bought wine flows freely. French House Party is what it says it is. Guests are encouraged to treat the house as though it was their own – with respect, of course! As I wanted to explore the area, I arrived a day earlier than the other guests. Bill the English chauffeur, gardener, pool maintenance man, etc met me at Toulouse Airport and told me a lot about the local history as we drove to the house. We were greeted by Moira, and her amazing housekeeper, Regine, who looks like a French Rula Lenska. She never stops working, and I’m sure she never goes to bed! After I’d freshened up, Moira and I went out for a drive. It’s a lovely area, very relaxing and French, not too built-up and with no grafitti or rubbish anywhere. In one direction you can see the Black Mountains, and the Pyrenees in the other direction. The Canal du Midi is within walking distance of the house. The Mediterranean is an hour away, and the mountains, popular for skiing in the Winter, are also an hour away. We went to a Miellerie where they hold very interesting Honey Tours. They have live cameras in some of the hives so you can watch what’s happening inside them. At certain times of the year, the hives are moved so that the bees can take the pollen from different plants and flowers. Moira and I had a tasting of all the different honeys that are made there. The variation in the taste and colours is amazing. Just a few yards and a change of plants produces completely different results. On we went to Carcassonne. It’s an ancient walled city where Robin Hood and the Prince of Thieves was filmed. We had a lovely meal there, which gave me a chance to practise my rusty French. In the morning, I had breakfast beside the pool. Regina had bought fresh bread and croissants, and I had coffee and orange juice. There’s nothing much better in life than sitting beside a pool in the sunshine, eating beautifully-presented French food. I swam and sunbathed until the rest of the party, three Scottish ladies, arrived in time for lunch. We had a quiche, made by Rula, I mean Regina. It was one of the best quiches that I’ve ever had. The pastry was thin and slightly crispy, and so was the spinach and smoked salmon filling. No more thick, stodgy quiches for me! In the afternoon, we were driven to Moira’s favourite local vineyard for a wine tasting while Moira stocked up on wine for the house. And then it was time to meet the chef, Robert Abraham. 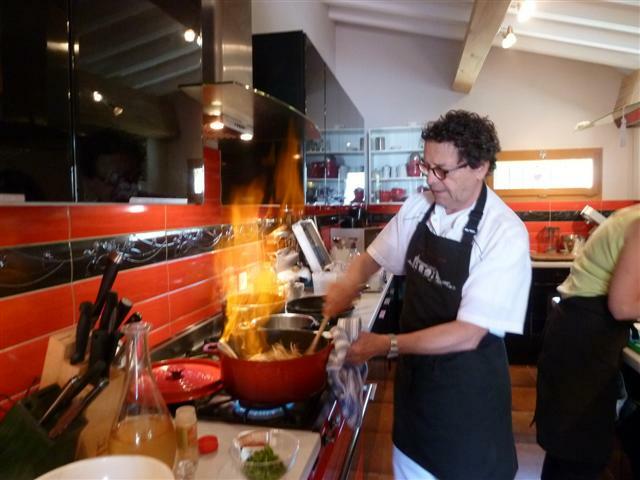 Robert has won many awards, including the Mid-Pyrenees Chef of the Year in 2009. He has over 26 years of experience. We made Shrimp Samosas, and a pate of creamed trout. Then we were free until 7pm, when we had Champagne and our canapés on the terrace. Dinner, prepared by Robert, was served at 8. The trout pate came first, followed by really tender duck fillets served on fresh local vegetables, then a fruit tart, and plenty of wine. In the morning, everyone left early to visit the local market and buy the day’s ingredients. Then it was time to prepare the lunch. We had asparagus with a strawberry balsamic vinegar sauce, then duck with local vegetables, and a selection of local cheeses. In the evening, we had Tandoori-style langoustines with baby leeks, followed by guinea fowl in beer, and dainty little potato blinis, made by us, then strawberries half-dipped in chocolate. One of the ladies had a crème brulee as she’d asked to be shown how to make it. The ladies went to bed late as it was their last night, but there was Regina in the morning, fresh and awake with the bread and croissants. Robert had sussed me out as more experienced than I’d let on, so it was Knives Out At Dawn! Well, not literally, but he was looking forward to our cooking session. First, Robert showed me a simple but interesting dish; Asparagus in a Parmesan crust, and pepper coulis. Just the top half of the asparagus is dipped in beaten egg, then a mixture of Parmesan and breadcrumbs, then gently fried in butter. The contrast between tender and crunchy works very well. Then I showed Robert Italian Omelette with the leftover beaten egg. The egg is tipped into a frying-pan with oil or butter in it, cooked, then flipped over to cook the other side. Then it’s turned out onto a plate or chopping-board, rolled up and thinly sliced. Robert suggested pouring the leftover pepper coulis over it. Result, a perfect partnership! Then we made my Greek Lemon Potato dish. Chop potatoes into large chunks and boil in a mixture of olive oil and water with a chopped onion, the grated peel and juice of a lemon and loads of chopped parsley. Don’t let all the liquid evaporate! The contents should be green from the parsley. Robert absolutely loved it and I’m sure that he’ll improvise it and use it again. We decided to serve it with tender lamb and a mixed salad. For dessert, Robert made caramelised strawberry kebabs with a mascarpone and cream mixture and warm strawberry jus. We were a great team and the food was top quality! After lunch Bill picked me up to take me to the airport and this time we took the scenic route, with Bill as my knowledgeable guide. Everyone has passed through the area, including the Cathars, the Knights Templars, the Visigoths, and WW11 resistance fighters. The locals are still very fond of the British. I absolutely loved the whole experience. The course is very laid-back, and you don’t need any knowledge of cooking to enjoy it. The house and grounds are perfect, with lots of hidden ‘secret gardens.’ The Carcassonne is beautiful. It’s worth spending extra time there to go out and explore, by car or on one of the bikes at the house. Moira’s colleagues are all great personalities, and very helpful. And the food and drink? Oo la-la, c’est magnifique. And I’m sure that I don’t need to translate that! The French House Party Carcassonne runs a series of cookery, song-writing, creative digital media and creative writing courses throughout the year. 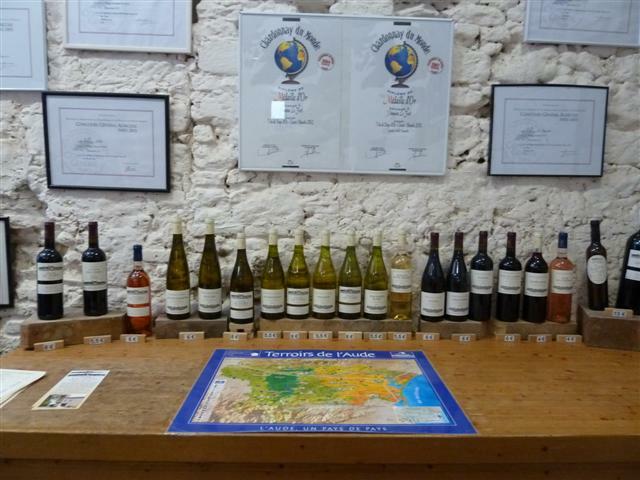 Address is Domaine St Raymond, 11150 Pexiora, Aude, SW France. The Gourmet Explorer 6-day, 5-night course costs £1,250 and the Cuisine in Brief 3-day, 2 night course costs £560. Prices are all-inclusive of accommodation, airport transfers, food, drinks and excursions. For more information visit www.frenchhouseparty.eu. Ryanair flies to Carcassonne from various UK airports including Stansted, Liverpool, Bournemouth and East Midlands. For more information see www.ryanair.com. EasyJet flies from Gatwick and other UK airports, including Bristol to Toulouse. For more information go to www.easyjet.com. For more information go to www.britishairways.com. Jet 2 flies from Manchester to Toulouse. For more information go to www.jet2.com. For more information go to www.bmiregional.com.